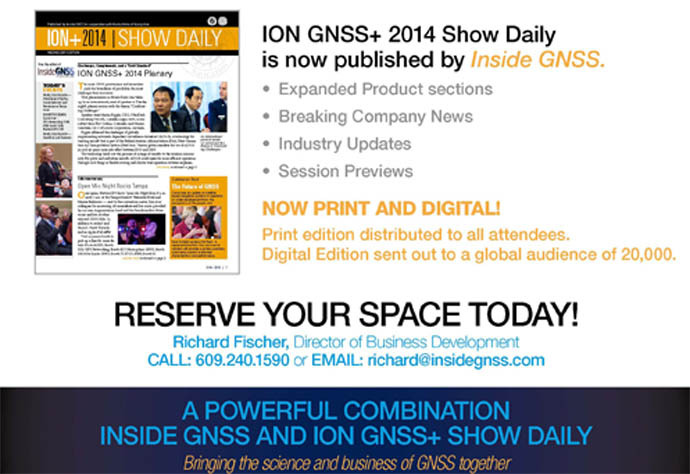 The Institute of Navigation is partnering with the publisher of Inside GNSS to produce, publish, and distribute an expanded Show Daily publication at this year’s ION GNSS+ 2014 event taking place September 9–12 in Tampa, Florida. 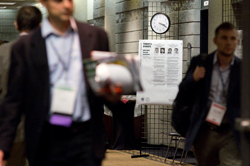 The alliance will leverage the magazine’s many years of publishing expertise to advance the business interests of exhibitors and attendees. Inside GNSS will expand the ION GNSS+ Show Daily offering to include a richer Products and Company News section as well as insider previews on content tracks planned for this year’s conference. Inside GNSS will also produce a digital version that will be sent to an online audience of more than 20,000 GNSS professionals around the world. ION Executive Director Lisa Beaty comments, "ION GNSS exhibitors, advertisers and conference attendees will have much to gain with the expanded format, reach and in-depth reportage of the new Show Daily. ION is committed to bridging the divide between science and business, academia and industry, and we believe that Inside GNSS, led by Glen Gibbons and Richard Fischer can help us achieve that." Companies interested in having a presence in the ION GNSS+ Show Daily may contact Fischer by e-mail <richard@insidegnss.com> or phone 1-732-741-1964 (office) or 1-609-240-1590 (mobile).